The developers of Expeditions: Conquistador have asked us nicely to interview them, and we answered by throwing a bunch of questions at them. 4. The Kickstarter description for the game claims that every character has a set of combat abilities. How many of them are there going to be, both per character and in total? Are these abilities determined by class or uniquely tailored for each character? Do you unlock them via some kind of skill tree? At present there are three abilities per character type plus one ability for the Sergeant rank and one ability for the Lieutenant rank (you may only have two Sergeants and one Lieutenant at a time). Since we have 5 Spanish character classes, that adds up to 17 abilities. Some of the Native classes share a few abilities with their Spanish counterparts, but most of them have different abilities, and if you allow a native character to join your expedition, you'll get to use those abilities as well. We really want to add character ability trees so you choose between 2 or 3 abilities when you promote a character, but it's a stretch goal - it depends on how much money we get from the Kickstarter. This is because all our abilities are active abilities, they're never passive, so they're somewhat time-consuming to implement. They still have more than two weeks to reach their goal, so get out your wallet and help them reach that kickstarter goal! Expeditions: Conquistador is a story-driven turn-based tactical RPG "with a touch of strategic resource management and a pinch of choose-your-own-adventure," currently running its Kickstarter campaign with about half of the requested $70,000 already collected and 19 days to go. In this interview, Logic Artists, the developer behind the game, answers some questions about Conquistador's setting and gameplay. 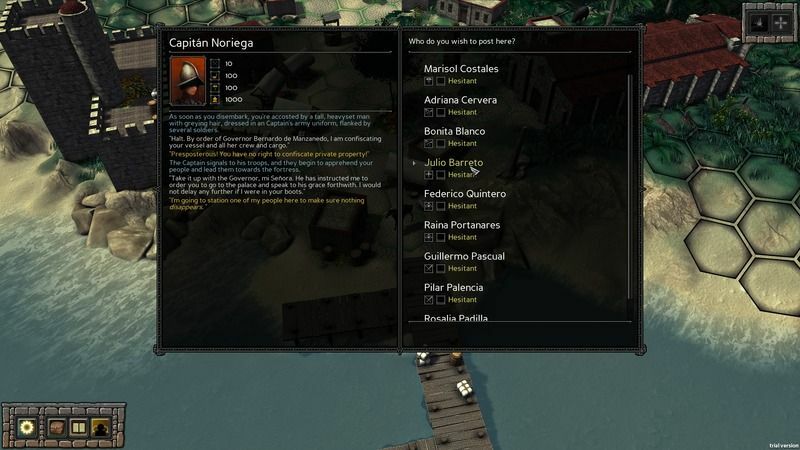 How did you come up with the idea to develop a CRPG set in Central America during the Spanish conquest, and what are the main inspirations behind the game's design and concept? 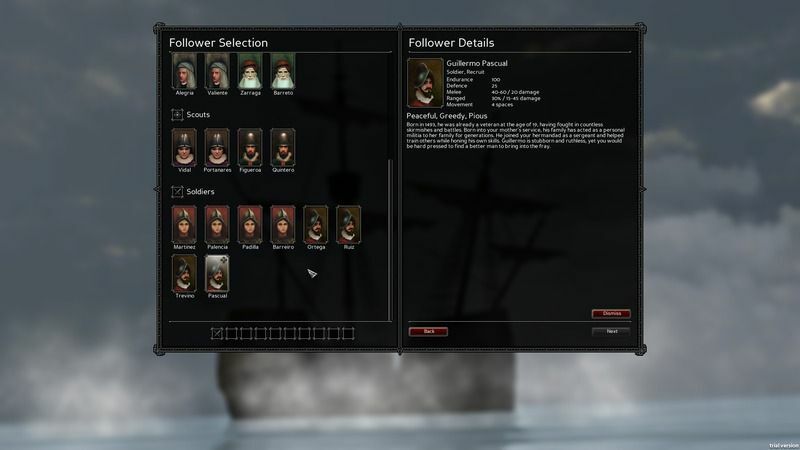 Can you talk a bit about Conquistador's character development system? What kind of attributes, skills, and other character progression mechanics do you plan on implementing in the game? Are there going to be non-combat skills, such as persuasion, intimidation or bluffing? The player character's skillset consists exclusively of non-combat skills. They are: Tactics, Diplomacy, Healing, Hunting, and Leadership. These skills are set at the beginning of the game and aren't levelled up manually, though some events may raise or lower one of your skills permanently. Each of these skills will open up new dialogue options in certain events, and a lot of the time you will be able to use them to change the premises of a battle (for example setting you up in a more advantageous starting position, reducing the number of enemies, or even opening up a whole new part of the battle field). They also influence different parts of the resource management metagame, with Leadership for example mitigating the impact of unpopular decisions on your people's morale or Healing reducing the Medicine cost of treating your injured troops. Are character promotions equivalent to experience levels, and if so, what do you gain experience from (killing enemies, completing quests, finding locations, etc.)? The Kickstarter description for the game claims that every character has a set of combat abilities. How many of them are there going to be, both per character and in total? Are these abilities determined by class or uniquely tailored for each character? Do you unlock them via some kind of skill tree? How do the combat abilities work? Are they cooldown-based, or do they cost energy or action points? How do you prevent the player from simply "spamming" the same ability over and over again? What are the differences between the player-created character and the followers? Are there more customization options for the player charcter? Speaking of the followers, I assume you can only recruit them on specific conditions and/or under particular circumstances. What are these conditions and circumstances going to be? Are all followers available for recruitment in any playthrough? We have two categories of followers, so to speak. When you begin the game, you select 10 expedition members from a list of around 30 (which is how many we have right now, but it may increase a little bit). The second type of follower are people you pick up on your travels. These will overwhelmingly be natives, and they'll join you (or not) based on your decisions during certain events or based on your allegiances in relation to the faction system - which means you won't be able to get all of them in one playthrough, no. Can you explain combat in more detail? How does movement work, and does the terrain have any effect on it? How do barricades work? Does combat primarily consist of attacking and moving, or do you use special actions on each turn? In combat, there are two things each character can do every turn: they can perform an action, and they can move a certain amount of spaces. The action can be an attack, it can be the use of an ability, or it can be converted into another move. Your movement and your action can be performed in any order, so you can move forward, shoot, and move back if you want (which is in fact a trick the AI uses a lot). Because you get to move all your people before you end your turn, it's fairly straight-forward to set up advanced maneuvres such as flanking or combination-attacks. The terrain has no effect on movement. 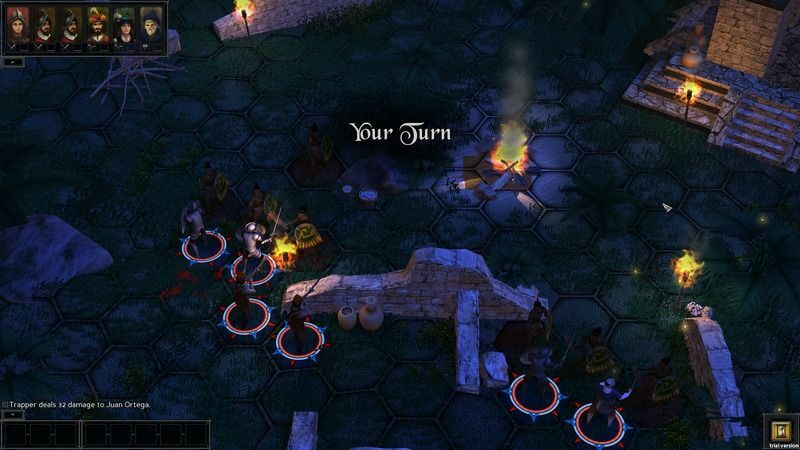 Conquistador is first and foremost a tactical RPG, but it also aims to incorporate some strategic resource management mechanics. How deep are these mechanics and what do they influence? 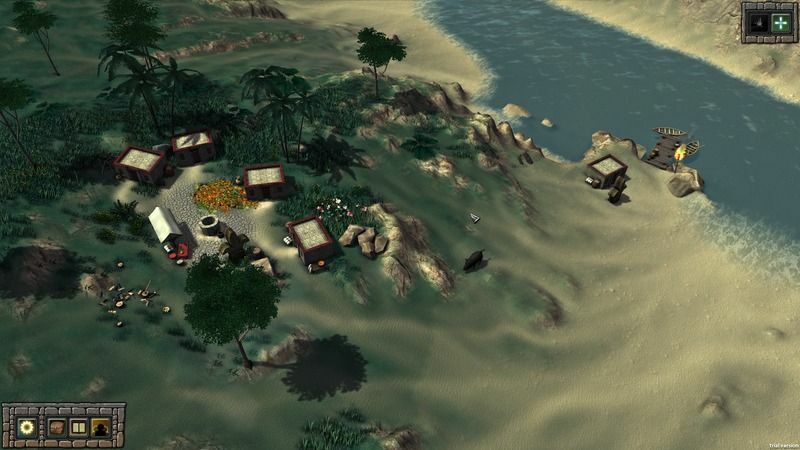 The player's expedition will have four major resources: Rations, Medicine, Equipment, and Valuables. Each resource plays a different role in the gameplay. Rations are used by your people every time you camp - you can deny Rations to a follower if you want (or if you're short), but that will hurt their morale. Medicine is used to treat followers who were injured in a fight or who have been infected by a disease or similar. Equipment can be assigned to each of your followers to increase either their Melee, Ranged, or Armour scores. Valuables are money, they're the most common reward you'll get for a quest and can be traded for the other resources, but they're also the best resource for bribes and similar during events (and are frequently used in combination with the Diplomacy skill). We want the resource management to be pretty deep without taking it to spreadsheet levels. For example, the cost in Medicine for treating an injured follower depends on the severity of that injury (which decreases every time you treat them until they're back on their feet) as well as the type of injury (treating a Disease costs more medicine than treating a Bone Fracture, but on the other hand the Bone Fracture is more likely to get worse if left untreated). We're also pretty pleased with our trading system, where the exchange rate of any two resources depends on how much of each the merchant has - if you're trying to buy something they have very little of, you pay more. If you're trying to sell something they have very little of, you pay less. What role will the resource and inventory management play during combat? Will there be healing items, and if yes, how rare will they be? Will you have to manage ammunition? Besides being a tactical RPG with strategic management, you also aim to have some elements of choose your own adventure. Why did you decide to implement CYOA elements, and what, in your view, do they bring to the table? With several different gameplay elements -- tactical combat, resource management, followers, CYOA with choices and consequences -- how do you balance them and the effort you spend on them? Which of these elements take up the most of the development time, and will take up the most of the player's time? Are there any interactions between NPCs, or is every event player character-driven? Can your party members act on their own, or interfere in conversations or events without your consent? Will the Church play any role in the game and, if yes, how accurately will it be portrayed? How much influence does the player have on how the story progresses? How linear or non-linear will the story be? Given the CYOA aspect, can you provide some examples of the choices and consequences we can reasonably expect from the game? The main thing of course is that we have a faction system - the main faction is the Aztec empire, surrounded by (and actively oppressing) all the small scattered tribes outside the city of Tenochtitlan. The main faction plotline gives you the choice of allying with the Aztecs or uniting the tribes against them. You can also just try to take on everybody for the glory of King Carlos, or you can try to ignore them and just hoard as much gold as you can before returning to Spain. How will the dynamic endings look like? Will every location in the game have its own unique ending, or will there be general endings for the entire gameworld? To conclude this interview, how far into development is Conquistador already and what are you most proud of about the game? To suppport Expeditions: Conquistador on Kickstarter, click here.